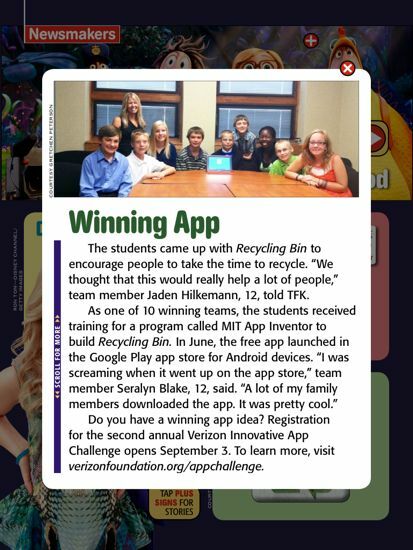 TIME for Kids featured this story about a team of North Dakota middle school students who used App Inventor to create an app to encourage more recycling in their community. 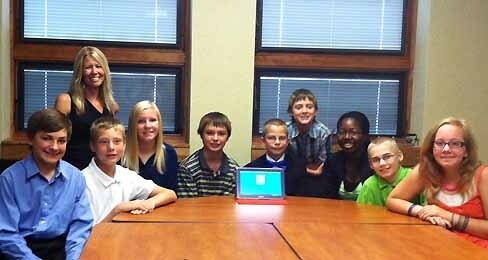 The students were finalists in the 2013 Verizon Innovative App Challenge. Their Recycling Bin app promotes recycling by providing users with an easily searchable map of recycling centers in the area. It allows these users to save their favorite locations and set reminders to recycle on their device. These students from STEM Center Middle School, in West Fargo, North Dakota entered the challenge as part of a school project. The challenge is sponsored by the Verizon Foundation as a promotion for STEM fields. Teams from across the country submitted app ideas and 10 teams were selected were selected to receive Samsung tablets, a school grant, and a workshop on how to build apps with App Inventor from a member of our MIT App Inventor Training Corps. 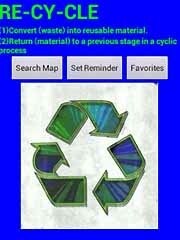 In June, the free Recycling Bin app launched in the Google Play app store for Android devices. Check out the original article on the TIME For Kids website.